Peanut butter and chocolate…is there a more heavenly combination? 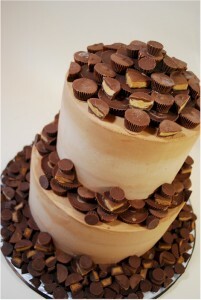 But seriously I am full-fledged Reese’s addict, and this cake is a dream come true! I came across this blessed jewel on Pinterest but it originated from the lovely Cup A Dee Cakes. They classified it as a groom’s cake but I happen to think that it would be a great non-traditional (and yet still traditional) wedding cake. And if you didn’t swoon over the copious amounts of Reese’s cups on the cake get ready for the deliciousness inside! It is a dark chocolate cake covered in peanut butter buttercream frosting. I’m in heaven ya’ll! Now if you will excuse me I am off to satisfy my Reese’s craving while you all contemplate the amazingness of this cake! I think I’m in heaven! We agree! It’s pretty fabulous Thanks so much for reading!